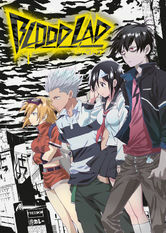 Blood Lad (2013) on Netflix India. Check worldwide Netflix availability! If Blood Lad isn't available in your country, or you are visiting a country where it isn't, there is still a way to watch it! Staz, a young vampire from the Demon World, vows to save a human girl who accidentally enters his world and is killed by a carnivorous plant. It's hard enough being a vampire. Now you've got to bring your best friend back to life. Talk about teen angst.